The Liars are two for three now in ‘Liar’s Lament’ after Hanna didn’t complete her turn. It’s Ali’s turn to play A.D.’s twisted game and a lot of secrets are about the be revealed, including the ID of her mother’s killer. 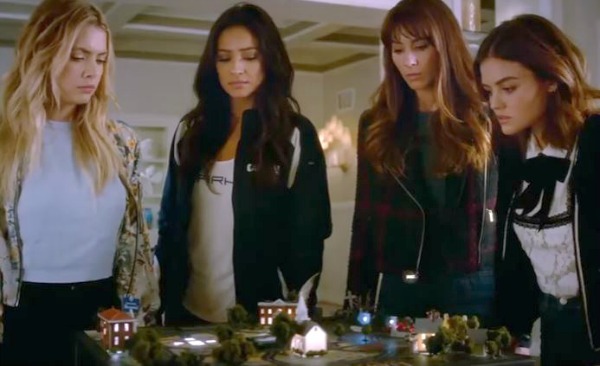 The game is now at Ali’s home where the Liars try to figure out what to do next. It was Archer’s finger (Ali’s husband they killed) that was mailed to the cops as punishment for Hanna not finishing her turn. They make a pact to not mess up another round or who knows what A.D. will send to the cops next. Before we get into Ali’s turn, there are other Liars to tend to. Spencer comes home to find her father is back. Instead of being out of the country like he said, he’s been home for a week searching for Mary Drake. He hired a private investigator to hunt Spencer’s mother down and when he’s not looking Spencer takes the investigator’s card. After hearing Mary’s side of things, Ted reconnects with Hannah at her apartment. Not only did Mary and Ted date in college, but they had a child together unbeknownst to Ted. That child was Charles, aka Charlotte, aka original A. Ted even worked at a camp for troubled boys where Charles went and they were close. He shows Hannah a picture of them with a third boy who was Charles only friend. That friend, is Lucas. Cue the dramatic music. Following plot twist number one, Spencer is hit with the next shocker. In the barn, Mr. Hastings scolds Spencer for speaking with the investigator. Like really, dude, you have no ground to stand on. He tells Spencer she was lurking around their house the same night Jessica DiLaurentis was killed. Mary apparently stole the pills after Jessica told her Charles was dead (before she knew he became Charlotte). Mr. Hastings doesn’t want Spencer anywhere near Mary because she killed and planted her twin sister in the Hastings’ backyard. Seriously, this town is messed up. Now onto reveal number three. Aria accompanies Ali to her secret destination for her turn which is a baby store. Of course Aria is confused because only Emily knows about Ali’s pregnancy. As they’re about to go in Aria gets a call from A.D. She tells Ali it’s Ezra and she’ll be right in after her. Instead, she follows A.D.’s instruction to meet elsewhere. This is actually the second call from A.D. after he/she contacted Aria the day before. On the call, A.D. showed Aria a file he/she has on her. A.D. said that Ezra would choose Nicole over her if he ever saw it. This led her to snap and chunk her game piece across the room wanting out of it all. Now that A.D. wants to meet, Aria is not backing down. She follows the GPS to a limo and inside waiting is Sydney. Offscreen, Sydney apparently tells Aria she’s behind everything. Lol okay, way to take someone else’s credit. Aria is confused (like the rest of us) about why Sydney is coming clean. She says it’s because Aria’s desperate and she could use desperate. Tired of the B.S. Aria cuts straight to the point wanting to know how she can get out of the game. According to Sydney there is no way out. However, Aira could always switch sides and be a part of the “winning team.” Aria spots Sydney’s earpiece meaning she’s not A.D. Thank goodness, because that would have been real disappointing. Since Aris wasn’t going to get out of the game or find out who A.D. really is, she bounces, but not before asking Sydney why she’s a part of this. “Because it’s no fun being on the losing team,” she says. Gag. Checking back in with our final Liar, Ali isn’t doing too hot. Not only did she learn that the police are changing Archer’s case from a missing person to a murder investigation, but now she’s in a baby store after Aria ditched her. Apparently A.D. set Ali up to create a baby registry. How thoughtful. Actually it’s not, since earlier Ali decided she wanted to terminate the pregnancy. Once done, Ali takes the scanner back to the front and the saleswoman gives Ali a gift that was “set aside for the egg donor.” Confused, she opens the gift and sees it’s a necklace with the name Emily on it. WHAT?! To refresh, at the end of Season 7A Emily’s eggs she was donating were stolen. A.D. is playing God and planted them in Ali. Now that is dark. After all has been revealed, the Liars are back together at Ali’s home minus Aria. They all fill each other in on the mind-blowing information from the day. Ali ends up canceling her abortion appointment to have more time to think about their “situation”, if you can even call it that. Aria shows up late and plays dumb to everything since she was just recruited to the dark side. Spencer reminds the Liars they have to stay together and not let the game rip them apart (lol). On cue, the game hums to life to reveal that it’s Hanna’s turn once again. She flips out since it’s supposed to be Aria’s, but alas, we know Aria has made a deal with the devil and the game skipping her is no mistake. Aria immediately gets the text, “Made a decision yet? – A.D.” Well Aria, what’s your answer?